A new study by the Employee Benefit Research Institute (EBRI) examined the level of assets held by families in popular retirement plans, such as 401(k)s and IRAs, relative to all of their financial assets. Among the families in the sample with a 25- to 64-year-old head of household, 38.9 percent had less than $10,000 in total financial assets, and nearly one in five (18.2 percent) did not even have $1,000 in combined assets. 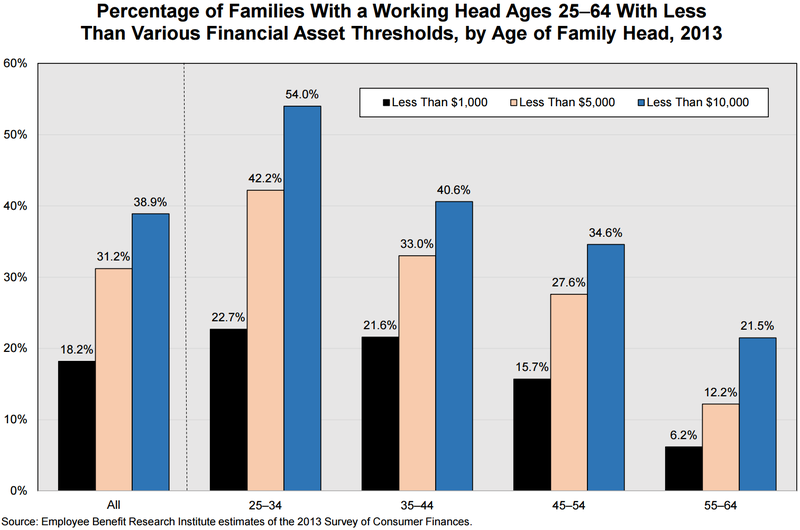 Unsurprisingly, younger households tended to have lower levels of financial assets but even 21.5 percent of families in the sample with a 55- to 64-year-old head of household had less than $10,000 in aggregate assets. That is an alarming statistic given the age group’s proximity to retirement. The researchers, though, also found that the likelihood of having a relatively low asset level fell sharply for families that utilized some sort of tax-advantaged retirement savings plan. Specifically, nearly eight in ten (79.6 percent) households without a 401(k) or IRA had less than $10,000 in total financial assets, while only 13.1 percent of the families with such a plan had less than $10,000 in combined financial assets. Those figures were even better for households that utilized both a 401(k) and an IRA. 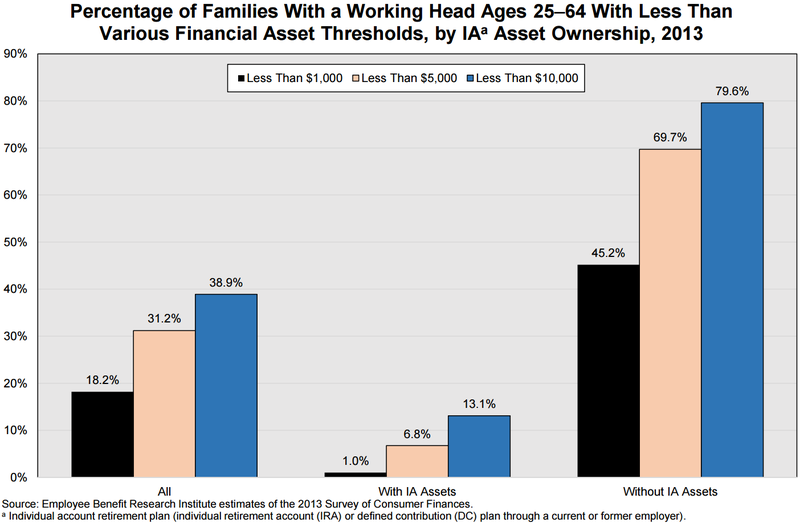 Given the positive impact that ownership of these retirement plans appears to have on total asset levels, it is encouraging that nearly a third (30.3 percent) of families with a working head of household age 25-64 were found to own an IRA, and 47.1 percent had a defined contribution (DC) plan through an employer. Access to the latter is likely to expand as more businesses boost their benefits offerings in order to better compete for talent in the tightening U.S. labor market. Further, the continued trend towards utilizing automatic enrollment and auto-escalation will help ensure that workers are getting the most out of the retirement benefits available to them.